Our backcountry ski offerings don’t see as much activity as we’d like, but they are enjoyed by some. 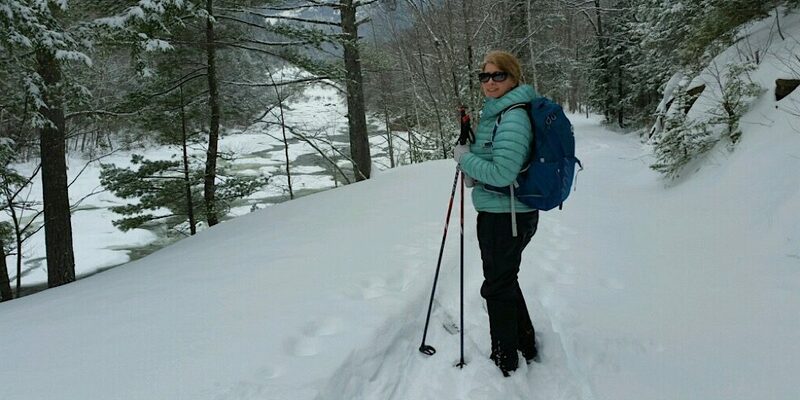 Today being a case-in-point when Redline Guide Jeffrey Shutak led two guests, Alison and Rebecca, on a backcountry ski tour on Nordic (cross country) gear. Thanks to the recent snow, Jeffrey could have picked anywhere — which is a nice surprise since a week ago we were wondering desperately about a plan “b” — and selected the lower Nanamocomuck Ski Trail from the Albany Covered Bridge to Rocky Gorge and Falls Pond, a distance of about six-and-a-half miles. The skiers and guide began the day at EMS renting the gear, which the staff there had kindly set out for us, and from there it was off to the covered bridge. They spent the early part of their tour on the logging road where it was flat and they could learn and get used to the gear. Jeffrey demonstrated “skins” for Nordic skis, and covered a lot of technique. 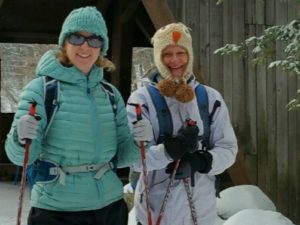 Alison had skied before, but for her the backcountry was a new experience. Rebecca, a friend of Alison’s visiting from Georgia, was new to cross country skiing altogether. On the exit route they followed bobcat tracks as an added bonus. Overall the trio had a fabulous day. 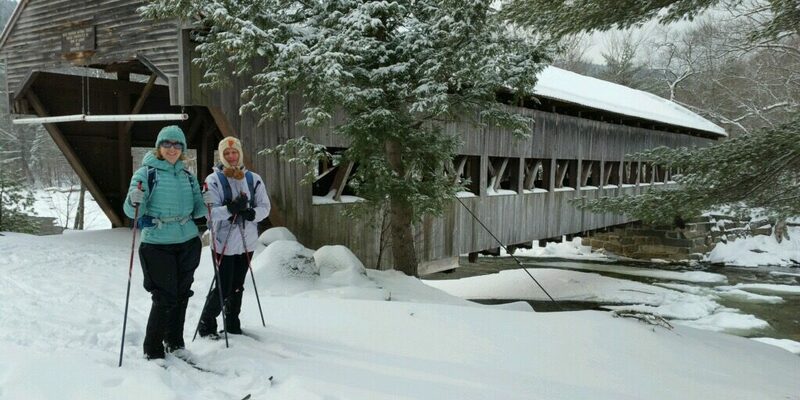 Our two skiers, fresh at the start by the Albany Covered Bridge. Skiing the Nanamocomuck is easier than saying the name for some. It looks like it was an incredible experience. A fine lead, Jeffrey!